Many of today’s leaders learned their trade in a rational, predictable and stable world. The leaders, who were successful were courageous and hugely ambitious, risk taking was rewarded. 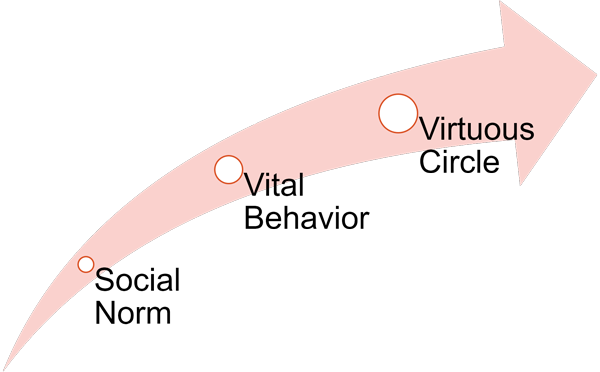 Unfortunately, in some cases and sometimes across industries, the risk taking morphed into “the end justifies the means” or even worse “as long as you are not caught…” This led to scandals and global crisis, that did not only eat up any profit previously made, but created huge distrust in society. So much, that whole professions have been vilified (banker), complete industries are viewed with derision (automobile) and even sport lost its shine (Olympics, FIFA). The world, we are moving towards with ever increasing pace, is different. First of all, it is characterized by an extreme transparency. Wikileaks, Panama Papers, investigative journalism at its best, make the possibility of being caught extremely likely. More importantly, the social norms are changing. When in the 1990s, people admired the “winner”, the one, who unashamedly says “greed is good”, today we look for leaders, who have, share and follow a strong moral conviction. The companies that flourish are the ones with a purpose! The benefits of a strong corporate governance and ethical leadership are customer loyalty, an engaged workforce, sustainable success. 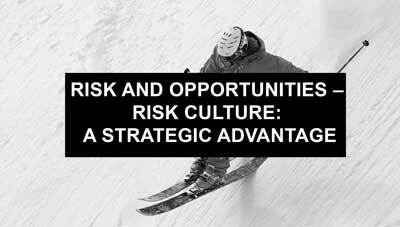 And the increased risk of being caught and damaging the organization irrevocably make for a strong business case to implement a strong risk & compliance culture throughout the organization. At the core of a strong risk & compliance culture you have transparency. Transparency creates the environment, that puts a spot light on anything, which is unclear, ambiguous or in a grey zone. And transparency allows everyone to create certainty for themselves and those around them, that what they are doing is right. It is not possible to have only yes/no choices. Already the different stakeholders: Shareholder, Customer, Employees, Society, Environment create dilemmas, that have to be solved case by case. And you cannot afford to have those decisions always be escalated to the top. A clear guideline starting with acknowledging the different stakeholders and possibly prioritizing them, is invaluable to help people take judgements in alignment with the organization’s strategy and values. Those companies and leaders, who always want it all, delegate the solving of the dilemma down. And when faced with this, people will decide on the safest course for themselves. Especially in an environment, that is not transparent and therefore not safe. 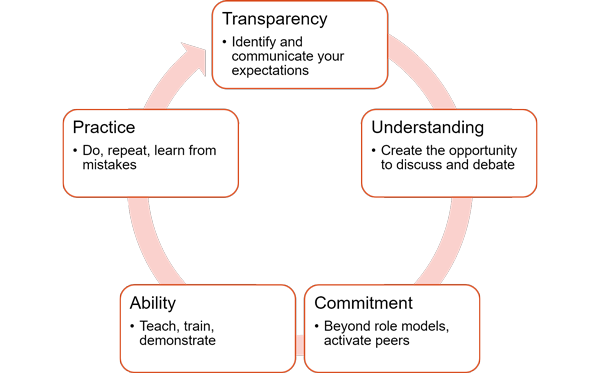 It is not so easy to start the personal journey towards more transparency and openness, let alone an organizational one. WHY? We will start with good intentions, but in times of risk or a crisis, we tend to default back to old patterns of behavior. Today’s world creates a transparency, that demands much more authenticity and consistency from leaders, than ever before. Very important is the different perspective between hierarchies. How often have I heard from leaders “I have made my intentions clear, therefore, everyone should know, what to do! The disconnect between, what a leader knows, feels and intends for her workforce and what the workforce perceives, is one of the greatest barriers for successful implementation of a new culture. But frequent and clear communication alone is not sufficient. The leader need to be seen to act in sync with her words, e.g. to praise someone, who has just lost a deal, because he acted in the customer’s best interest. And the leader needs to create good feedback mechanism, so she hears immediately and directly, when she acts or communicates against her stated intentions – even if unintentionally. The rules say, don’t take this risk, but your bonus depends on it. What to do? To complement the communication and the role-modeling, the systems & structures of the organization must be coherent. First of all, the reward and incentive structures need to align. This has started in many companies with the identification of Key Risk Takers and a bonus structure, that should incentivize them to act as guardians of their company. Similar expectations have been created for boards including in some countries severe penalties, if they don’t. Unfortunately, any structure can be “gamed” and will be, if you do not have the commitment. Hiring and promotion needs to follow suit. Actually, more important than money are other motivators, in particular recognition. Therefore, it is very important to clarify your criteria for hiring and promotion. This is a neglected field to define the traits, skills and behaviors of the people, you expect to thrive in your organization. Even more neglected is sticking to it. Do not forget to clarify the way “things are done” in your organization. In many organizations people will follow the existing social norms . This can be very detrimental, if those processes still follow old patterns. I particular how decisions are made, is something neither clarified, nor discussed and worst of all not consistent in many organizations. Successful leadership teams have a clear agreement how they reach decisions and the open environment to hold each other accountable to it. There is another important aspect to decision taking. Gerd Gigerenzer calls it defensive decision taking, when a leader makes a suboptimal decision, because it is the safest course for himself. An important influence for good decision taking is to create the transparent environment, where all options can be discussed openly. Organizations, who want to compete in today’s much more transparent and connected world, do not have a choice, but to create this risk & compliance culture based on alignment & judgement versus command & control. Many boards completely overlook the “soft” aspects in teambuilding and decision making. Effective supervisory boards do not only rely on technical competence. Research has proven that soft factors are vital for team effectiveness. To create a high performing team, you not only need individuals with high EQ, but as well work on the team dynamics. So why has this not reached the most important teams there are. Supervisory boards take the strategic decisions, that make or break an organization. And yet, very often the teams don’t spend enough time on how to work effectively as a team. How to create an aligned team, how to discuss the right topics and how to ensure high quality decision making. Your organization already has a culture and norms, how to influence it? Social norms are what makes communities work, they are the unspoken and often unconscious rules, that help you be IN or OUT of the community. It is an evolutionary need for us to be IN and unfortunately often we create the IN feeling by defining, who is OUT. It is not complicated to start the journey, but to stay on course, it helps, if we are guided by role models, examples and stories and develop the capabilities to not revert back to old behavioral patterns. The Trainings, we deliver, for example leadership, communication, team building, they all start with exploring the purpose and of the different perspectives everyone has. Through exploration and mirroring techniques, we start recognizing the gaps in mutual understanding and the grey zones for decision taking. And even more importantly, develop simple steps, how to pause before taking instinctive action driven by our old patterns. These skills are extremely useful for any leader and any team, that wants to keep or develop a trusted working environment for higher performance.  But it is not skills alone, that support your journey: The best, albeit at times seemingly slow and cumbersome, way to create a culture of judgement and decisive action. This can only be achieved, if you as a leader can let go and give the people the freedom to find their own ways within your clear guidelines and with a strong compass. This cannot be a one-off exercise. A workshop or a team discussion can be a good starting point. But how to keep this alive, when normality and business as usual kicks in again? To arrive in this new world, you need new skills, fresh attitudes and the right behaviors. You will need to create the choice architecture for better decision taking, but more importantly you will need to create a transparent environment. From transparency will come TRUST. And this can be the anchor for achieving what you want not only for a strong risk & compliance culture, but for any future change journeys. You will need training programs, communication strategies, and most importantly leaders, who are courageous asking for feedback and willing to continuously self-improve. We can help you to create the elements for a sustainable and credible risk & compliance culture with leaders, who embrace transparency and know how to decide courageously.